Tasker Howard Bliss was born in Lewisburg, Pennsylvania, on 31 December 1853. He graduated from the United States Military Academy in 1875, was commissioned a second lieutenant, and assigned to the 1st Artillery. From 1876 to 1880, he taught French and artillery tactics at West Point. In 1880, he was promoted to first lieutenant. Two years later, he married Eleanore E. Anderson. From 1884 to 1885, Bliss served as an adjutant of the Artillery School at Fort Monroe; later he taught at the Naval War College. Bliss then served as an aide to the commanding general of the Army from 1888 to 1895. Promoted to captain in 1892, Bliss was on special duty to the Secretary of War from 1895 to 1897. Then he served as a military attache to Spain in 1897. Just before the outbreak of the Spanish-American War, Bliss was promoted to major and soon to lieutenant colonel of volunteers. During the Puerto Rican campaign of the war, he was the chief of staff of the 1st Division, I Corps. After the war, he was a customs collector for the port of Havana. In 1901, he received his first star, and was made a brigadier general in the Regular Army in 1902. Bliss was president of the Army War College from from 1903 to 1905. He next served as the commander of the Departments of Luzon and Mindanao, governor of Moro Province and then commanded the Philippine Division. He returned as the head of the Army War College from 1909 to 1910. Bliss then commanded the Departments of California, the East and the South, respectively. He served as assistant Chief of Staff of the Army from 1915 to 1916. In November 1915, he was promoted to major general. He served as Chief of Staff of the Army from 22 September 1917 to 18 May 1918; he was made a temporary general in October, 1917. Bliss was a delegate to the Paris Peace Conference of 1918 to 1919. Returning home, he was the governor of the Soldiers’ Home in Washington, D.C. from 1920 to 1927. 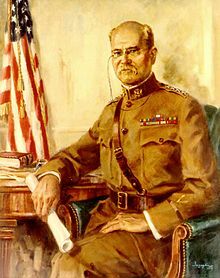 He retired in 1930 and was made a full general on the retired list by Congress. Bliss died on 9 November 1930, in Washington, D.C.